By June 28th, 2017’s NCAA Baseball Champion will be crowned. Unfortunately, Tech baseball has already lost its chance at being best in the nation. For the first time in his 24-year tenure with the Jackets, Coach Danny Hall finished the season with a sub .500 winning percentage. The season was the epitome of what Tech baseball has become for the past few years: a strong start followed by subpar play in conference due to injuries and other factors. Additionally, Tech failed to qualify for postseason play for the fourth time in Hall’s years at Tech and the third time in the past ten years. This year, the Jackets started the season off hot with a record of 9-2 before conference play began. In that time, the bats were hot and freshman catcher Joey Bart was leading the way to what seemed like a good year. Much like the past few seasons though, that energy was short-lived. 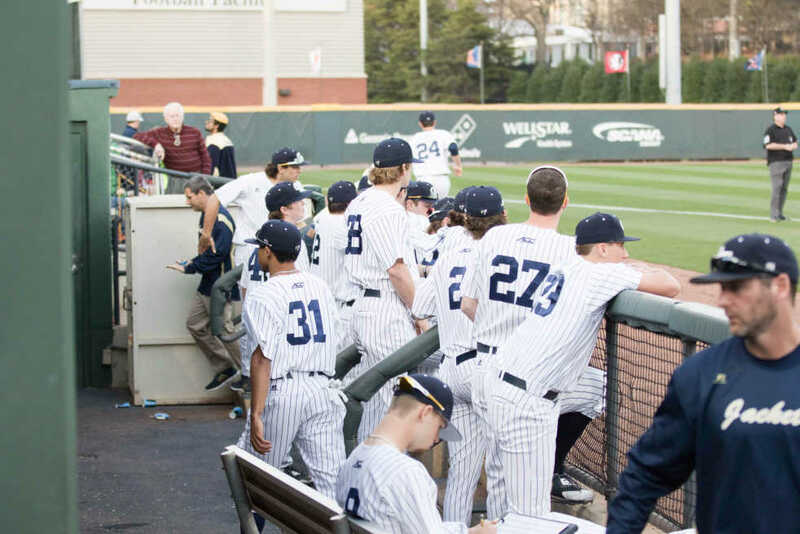 The main problem for the Jackets was a distinct lack of quality pitching, something that is beginning to show itself as the most valuable commodity in college baseball. With sophomore Tristin English being lost to the dreaded Tommy John surgery in January, Tech’s rotation was already looking thin heading into the season. It did not help that of the top four pitchers by innings pitched last season, three graduated and the fourth, senior Ben Parr, only threw 8.2 innings this season. After the first few games however, doubters were silenced as the pitching staff seemed to not allow too many runs so the powerful Tech offense could outscore opponents easily. That optimism came to a screeching halt when Tech entered conference play. As one of the top athletic conferences in the country, the ACC continues to bring some of the strongest baseball competition to the table. It was here that it became obvious that Tech’s shortcomings with pitching would not be offset by the characteristically good hitting. The reason for this is twofold; Tech’s hitting always starts strong against weaker, non-conference opponents and hitting is more inconsistent than pitching. What is clear is that Tech continues to rely on hitting, and that the pitchers usually feed off good hitting. In games where the Jackets scored at least 10 runs this season, they were a perfect 12-0, and in all of those games they never gave up runs in the double digits. On the other hand, in games where their opponent scored 10 or more runs, the Jackets were a meager 0-11. Another point of note: of the 12 games where the Jackets scored 10 or more runs, only two came against conference opponents, and in the 11 games where they gave up 10 or more runs, nine came against ACC opponents. Since 2011, the ACC slate has continued to plague Tech. That year they finished tied for first in the Coastal division with a 22-8 record, and since then they have not been able to clear the .500 mark and continue to slip down the standings. These issues may stem from a variety of factors including the addition of teams like Louisville, the steady increase in difficulty in recruiting in the college-dense south and the introduction of the BBCOR bats. The first, the addition of other colleges to the ACC has not played too much of a role; in fact, it should help Tech. Louisville, the toughest of the recently added schools, is in the Atlantic division of the conference, meaning Tech does not play them every year like they do against division opponents. The reason this addition of teams should help Tech is the addition of Pitt to the coastal division, a team supposedly worse than Tech every year, should lead to another series win every year for the Jackets. This year, Tech swept the Panthers 3-0 in their series, one of the lone bright spots in Tech’s conference season. The second issue at hand is the increased difficulty of recruiting in the south. Gone are the days when it can be expected that local athletes will attend local schools. Now, it is up to coaches to market their and their school’s brand to recruits. Lucky for Tech, they sit in the middle of a hotbed of talent that has attracted baseball organizations such as Perfect Game, responsible for most general scouting one on player, to the area. This means that Tech should be seeing more and more talented players, allowing for more opportunities to recruit high quality players. The problem gets larger when considering the barriers that Tech faces. First, it is competing against all other universities in the southeast. Furthermore, it is a technical school with more rigorous requirements and fewer stereotypical athlete majors. The last, and probably one of the most important issues that has plagued Danny Hall and the Jackets over the past few years, has been the introduction of the BBCOR bat. BBCOR stands for ball-bat coefficient of restitution and refers to how much “give” a bat has when it makes contact with a baseball. Prior to the 2011 season, in which the BBCOR bat was made standard, college baseball was all about hitting. This environment fit Hall’s coaching style quite well since he recruits and has developed many quality hitters over the years. BBCOR bats were introduced in response to the epidemic of too many home runs. Per data obtained by the NCAA, the number of home runs per game between 2010 and 2011 decreased from 0.94 to 0.52, the largest drop found in the data which went back to 1970. Additionally, the amount of runs per game dropped from 6.98 to 5.58, also the largest drop seen in the data. While Tech did manage to stay afloat and tie for first in the conference in the 2011 season, the effects of the new bat standard on Tech baseball have grown over the years. As less runs are scored, the focus on good pitching grows, something, it seems, that the Jackets have yet to catch onto. At this point, something needs to change if Tech has any hope of returning to its winning ways. Hall and his coaching staff must either adapt or continue to stagnate at the bottom of the Coastal Division. The new college baseball landscape has shown that pitching is king. If Tech is to return to the form it saw in the late 90s and early 2000s, it will require a major shift in the way the team recruits and goes about playing the game; pitching must be the new focus. Hall has proven his ability in developing quality hitters; however, in recent years, he has been lacking in developing a consistent pitching rotation. With a hotbed of talent in Georgia concentrated around the East Cobb area, Hall should have no trouble finding the players he needs to return Tech to the top of the ACC. Hall’s five year extension he signed last year will come into effect soon, and with AD Todd Stansbury opting to hire a new softball coach, he must adapt or risk being let go.